You have head it and I have heard it. Time and time again: You have tried and I have tried and we both fail. So much so that the next time, we don’t really even attempt. I am talking about the challenges we get from so many churches today. You know, after the three points and after the blanks are all filled in, there is the big “take-home challenge”, The “what to do”, the “how to live it out”, the “this week” or “next 40 or 90 days” and on and on. Really though, we have no reason to fail: we have just been showed where the Bible tells us to do it, we were told how Jesus or the other Bible characters did it and if they did it, surly we can. But we fail, I fail. So why do we fail? In my opinion, we fail because we cannot succeed. Now, I know that sounds like a “duhh” statement but think about it for a minute. We cannot succeed in living a life that is pleasing to God. If we could do it, do you really think God would have sent Jesus to die for my sins? Our sins? If there was any other way, don’t you think that our creator would have taken that way. It is through the perfect life of Christ, his death and his resurrection that our failures are wiped away. Not through my success (or lack of) in meeting a challenge. Now don’t take this as a free pass to live a life of foolish choices and stupidity. But also don’t just try to live better because myself or some pastor told you to. You try to live a life pleasing to God out of sheer gratefulness for what Jesus did for us on the cross! But know that you will mess up and know that His grace is still sufficient! But also know that Jesus didn’t leave you here to fail. And unfortunately, with 3 solid points, an acronym or two and 3 to 5 blanks, there isn’t enough time in Sundays message for this part: Jesus gave you everything you need to succeed: The Holy Spirit. It’s truly sad that Jesus’ work on the cross isn’t talked about in a service every now and then, but the Holy Spirit gets no love in a lot of church messages (except for the charismatics!). See we were left with a helper, The Helper! We sing about him when we quote from Zechariah 4:6 ….’Not by might nor by power, but by my Spirit,’ says the Lord Almighty. But we don’t share it in our challenges. Look, it is God’s will that you live a life pleasing to Him. Don’t you think He wants you to succeed at that? Every good and perfect gift is from above and the Holy Spirit is a good and perfect gift!. Instead we tend to convince you that we are right and you should meet the challenge because of that. We word it in cleaver ways so you can remember it, heck sometimes we say what God said SO MUCH BETTER than when he said it (Ok that was a little sarcastic but just listen sometimes. ), we use creative visuals, movie clips and images. And it works, you and I walk out saying: “I’m gonna do it this time!” And we leave the Helper out completely and we fail. When will we learn to lean on Him? When will we accept the entire gift that God gave us? I don’t know about you but I am tired of trying to do something on my own that I was never meant to do on my own! My might is not enough and my power is weak, but by His spirit! 2 Corinthians 2:4 My message and my preaching were not with wise and persuasive words, but with a demonstration of the Spirit’s power, 5 so that your faith might not rest on human wisdom, but on God’s power. John 16:5 “But now I am going to Him who sent Me; and none of you asks Me, ‘Where are You going?’ 6 But because I have said these things to you, sorrow has filled your heart. 7 But I tell you the truth, it is to your advantage that I go away; for if I do not go away, the Helper will not come to you; but if I go, I will send Him to you. 8 And He, when He comes, will convict the world concerning sin and righteousness and judgment; 9 concerning sin, because they do not believe in Me; 10 and concerning righteousness, because I go to the Father and you no longer see Me; 11 and concerning judgment, because the ruler of this world has been judged. 12 “I have many more things to say to you, but you cannot bear them now. 13 But when He, the Spirit of truth, comes, He will guide you into all the truth; for He will not speak on His own initiative, but whatever He hears, He will speak; and He will disclose to you what is to come. 14 He will glorify Me, for He will take of Mine and will disclose it to you. 15 All things that the Father has are Mine; therefore I said that He takes of Mine and will disclose it to you. I am not knocking on any challenges you are given at any church. I repeat: the challenges are good! We should try to live better, we should be growing in spiritual maturity and we should repent of our sins. But what I want you to know is this: weather or not the challenge is offered with the assurance that we have a great Helper to get us through it, WE DO have just that: A great Helper, the Holy Spirit, to get us through it. So take the challenges but lean on the one who can and does succeed. If we could have done it on our own, we wouldn’t need the Cross. 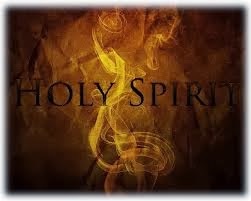 If we could do it on our own, we would not need the Holy Spirit. So next time you think you cannot do it on your own...you are right, you cannot do it on your own and you don't have to!